The walls of Gema Sanchez’ small home in Miami are decorated with crosses and Catholic rosaries, and on this day, Sanchez was thinking of another house in Cuba years ago when she spent Sunday mornings in church and Sunday afternoons cooking arroz con frijoles with her Abuela, or grandmother. They always sang Celia Cruz songs, she said. “She was like today’s Beyoncè,” Sanchez laughed, remembering the Afro-Cuban musical icon who died in 2003. “Cubans are known for our love of singing and dancing but only because we needed to stay occupied to survive,” Sanchez said. 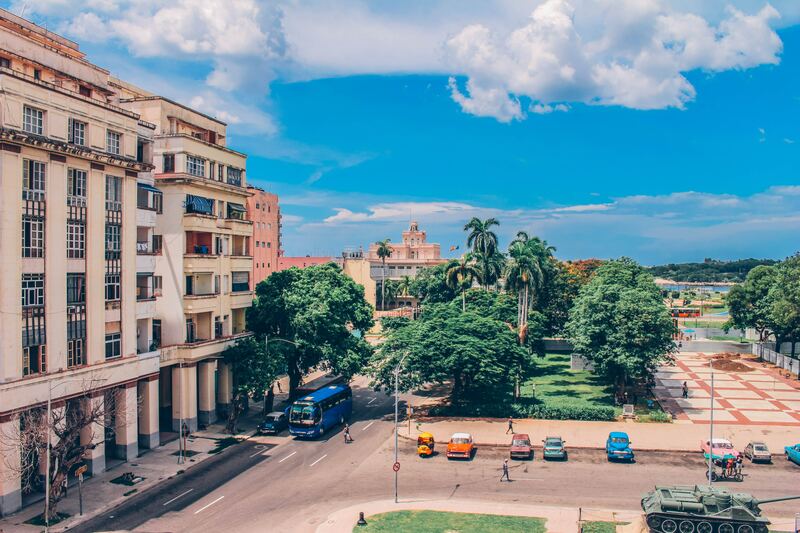 As she described her memories of Cuba and her grandmother, pride and sorrow overcame her simultaneously as the corners of her mouth lifted and quickly dropped. The country Sanchez remembers when she fled in 1971 as child was filled with beauty, laughter and music. Now she sees it as filled with desperation and scarcity. Born in Santiago de Cuba in 1962, only three years after Fidel Castro came in to power, Sanchez remembers a seemingly typical childhood doused in “Agua De Violetas,” an iconic Cuban, floral- scented baby perfume. Little did she know, Sanchez was growing up during the repressive aftermath of Castro’s election. Castro’s forces overthrew Fulgencio Batista, Cuba’s president, and from 1959 to 1970, nearly 450,000 Cubans like Sanchez migrated to the United States, according to the Migration Policy Institute. “It is hard to explain things about a country completely dominated by a single person,” said Juan Fiol, a Cuban-born historian and advocate for the Cuban Republican community in South Florida. The Castro regime seized private businesses and farms, and began cleansing the island of people who did not align with the ideologies of the government. Between 1959 and 2016, 4,000 people were executed on the island, according to The Anti-Castro Archivo Cuba. “Anything he [Castro] touched became his and he touched every aspect of our lives at this point,” said Fiol as he cleared his throat. Suddenly, violence in Cuba became unbearable. The Cuban people were scared to be thrown in prison for reasons none other than because the authorities could. Parents were fearful that the regime would send their children away so those who could, fled. Cubans who were doctors or landowners left their country and found work as gas station attendants or maids, like so many others around the world experiencing exodus from their homes. Castro created an environment of catastrophe that Cubans have yet to recover from. Today, nearly 2,000,000 Cuban exiles exist in America; Florida with the highest population and New York, the third largest, according to Fiol. Sanchez recalls her neighborhood in Cuba having a profound impact on her life. She grew up in a town called Oriente, or Oriental, where the community was predominantly comprised of “Chino- Cubanos,” a term of endearment for Sanchez. “My Papi left Communism in China and fled to Cuba,” Sanchez said. “Then he had to leave Communism in Cuba.” Sanchez’s father was a Chinese refugee. He arrived in Cuba in 1953, where, like his ancestors, he found work on farms. During the mid 1800s, around 100,000 Chinese left China to find better work in Cuba, according to Fiol. Many men in the Chinese community ended up working as indentured servants, as did members of the Caribbean, Spanish, and African communities. Today, most Chino- Cubanos are of African and Spanish descent because of this. Sanchez attributes being surrounded by other Chino-Cubanos as the reason for, what she referred to as her “ignorance is bliss- type childhood.” She rarely felt exposed to what were the realities of Cuba outside of her Chino-Cubano community. But, the Cuban revolution intruded and each aspect of her family’s life was dictated by the government, Sanchez said. Each month, her family, along with hundreds of thousands of others was sent rations of rice and beans. Sanchez’s father obtained meat off the black market. This was all they had to survive off of until the nest disbursement. It was not until later on that Sanchez began to recognize the drastic effects the new government would have on her life. Sanchez grew up the second- oldest of four children; one sister, Bilai, and two brothers, Robert and Lim. Today, she bases much of her identity as a woman on the care she took of her siblings during their journey from Cuba when Sanchez was only 9 years old. From Cuba, Sanchez and her family were forced to flee to Spain. Spain is the country with the second largest population of Cuban migrants, after the United States, according to The Migration Policy Institute. With the help of the Chinese Embassy in Spain, they lived there for three years, part of it until they were declared free of tuberculosis. They moved to Vienna in 1974. Sanchez said Vienna became a hub for many Cuban-Chinese migrants. In 1975, Sanchez, along with her siblings and parents, found refuge in Los Angeles. They survived on U.S. government welfare benefits. After her parents’ divorce, Sanchez moved to Miami, Florida where she found work at a Cuban bakery. “They played Celia Cruz every day and it reminded me of my grandmother,” she said as she smiled and titled her head up as if she were looking to heaven. After school, Sanchez would walk to the bakery where she would work until 9 p.m. She made 75 cents an hour. Sanchez said she did what she could to help her mother support the family. Sanchez still visits the bakery for empanadas and pastellistos de guayaba. Sanchez has resigned herself to life of escape from her past. She has been following closely the current humanitarian crisis in Venezuela that she says mirrors what happened in Cuba when she was a child. In 2015, Sanchez allowed Chama Perez, a Venezuelan mother who had arrived in the United States, to live with her. Both women were caring for teenage sons, Daniel and Diego. Following the death of Perez’s husband, she experienced major financial hardships. Perez lived with Sanchez for a year. During the presidencies of Hugo Chávez and current leader Nicolas Maduro, Venezuela has suffered a humanitarian crisis. 90 percent of Venezuelans live below the poverty line, according to Mercy Corps, an International, humanitarian- aid organization. Deaths by starvation and malnutrition reaching the hundreds in 2017 alone, escalating crime rates, scarcity of medicine, and daily violent protests have roiled Venezuela for months. “Venezuela today is like a mirror for Cuba when I lived there so it’s sad but history is repeating itself,” said Sanchez. “That’s why I knew I wanted to help. I was capable because I knew what [she] had been through…not everyone does,” she said as she recounted her experience with Perez. Both Sanchez and Perez can relate to those lyrics.